If you are planning to set up a new living room or conduct the renovation, then it is the right time to think about the best way to design the interior. Setting the furniture arrangements, chances are you want to research to find out some ideas from the internet. If you are looking for furnishings which are long lasting and durable, the Indonesian indoor teak furniture from Indoor Teak Furniture Manufacturer is the right answer for you. Depending on how you are going to use your spaces in your home, you might look for something that can withstand the outer factors. That means you will not see your furniture wear out anytime soon. Your home is not only your shelter but also the place for relaxation. That is why it needs to be decorated with a proper care. It is especially true if you and your family spend the valuable times together there. You must be very creative in decorating the rooms in your house so that it can be the peaceful and welcoming place to stay. It is not a surprise that the Indonesian indoor teak furniture has been one of the most prevalent choices these days. It is because everyone loves the traditional wood finish now. Keep in mind that you will be living in your house for years. Ordinary furnishings may be worn out and forced you to replace them. That will be an expense that bothers you fiscally. Teak, on the other side, is a sturdy material which you can rely on for years. The durability of theteak furniture has been very popular around the world. These are able to withstand extreme weather, termites, pests, and heavy users. That’s why you can see many teak benches in the public recreation park. But when it is adapted to the indoor spaces, the versatility will be increasing more. The teak furniture signifies the exclusiveness and privileges. When you enter your house, you will be proud of what you see. The strong and firm posture of the teak furniture combined with the appeals will make you want to spend more time with family at home. The teak furniture also represents the classy ambiances of the rooms. This will make your guests stunned. Although the teak furniture is categorized as a traditional wood craft, you can’t go wrong when adding this into your contemporary or modern house. The good thing about the Indonesian indoor teak furniture is that you can combine them with the most recent concepts. So you don’t have to be following the mainstream in the market and just focus on your interests in Teak wooden masterpieces. Wisanka, as the largest Indoor Teak Furniture Manufacturer, offers different types of shapes, colors, designs, functions, as well as versatile furnishing pieces that will fill your rooms with everlasting elements. The modern designs of your house can include just about everything you see in Wisanka collection. There are an almost endless number of Indonesia indoor teak furniture designs that you can consider. Not to mention that you could also customize the design of your furniture. So there will be the most suitable furniture for your room later. 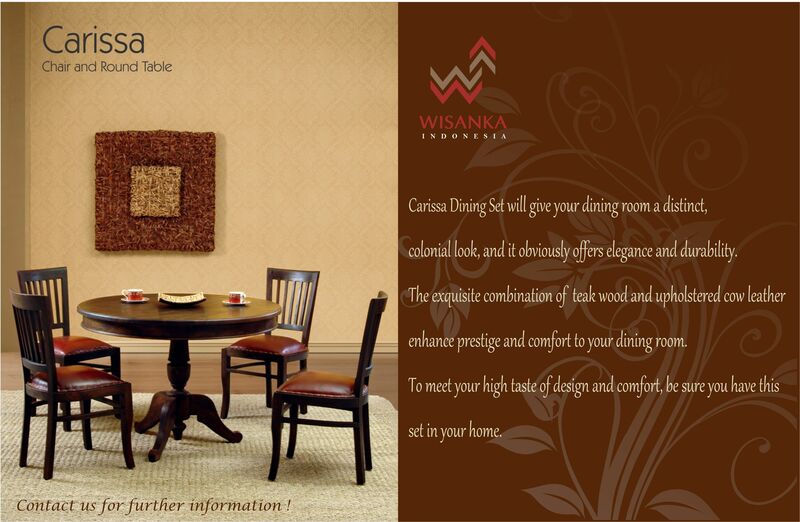 Wisanka only provides the original teak furniture since it is highly valuable for most customers. The Teak furniture by Wisanka has genuine and unique characteristics. There have been many similar kinds of wood under the “teak” label name, but you must be cautious if you want to check the other sites. The genuine teak wood is a great material for designing interior furniture and al fresco home furniture pieces. It might be your first time to select the teak furniture. If you are not getting ample amount information beforehand, you might end up with wrong products. It is important to keep you informed on the characteristics of the real teak furniture. Since there are now some furnishing pieces which are really disappointing in features and performances, you can’t afford to lose your money for replicas in the market. But you have come to the right site, Wisanka only provides the teak furniture which defines the authentic characteristics of the true hardwood. When you see the collections at Wisanka Indoor Teak Furniture Manufacturer, you will know that those are real. The true Teak Wooden Furniture has darker in shades of golden yellow, golden brown, chocolate brown, as well as rich brown. For your information, the fake ones might have pale yellow color. Then the next thing to look at are the grains of the wood. The real teak furniture has straight and little wavy grains with the texture which is not evenly distributed. The genuine Teak wood does not cleave. And if you have a chance to check, you can feel the smooth feeling when touching the surface of teak furniture. Try to rub the surface of the furniture and you will know its authenticity immediately. The teak furniture is one of the best home furnishing materials that are durable, long lasting, sturdy, as well as captivating. The unique design of the natural textures has been considered as a valuable investment in many households. When you rub your hands on it, it does not feel like other woods. Of course, it is hard because categorized as hard wood, but you could tell the difference between the teak and other woods. The next thing that helps you identify the authenticity is the smell of the teak furniture. In teak furniture, you can smell the light fragrant coming from the end of the wood. It is an earthy smell but not really intrusive. In fact, some folks even embrace this smell because it reminds them about the wilderness. You may guess that the carpenter injects the essential oils in the teak. You are almost correct. Teak has this fragrance because of its natural essential oils contained in the wood. Teak’s colors will change eventually as the time goes by. This is also the characteristic of the solid teak furniture. The teak colors will change depending on where you put the furniture. If it is in indoor rooms, the teak furniture color will change to darker browns and oranges over time. These beautiful natural colors will enhance the ambiances of your rooms. The good thing here is that you can find many types of furniture in Wisanka Indoor Teak Furniture Manufacturer to add them to specific rooms at your house. This entry was posted in Articles and tagged Indonesian teak furniture, Indoor teak dining table, indoor teak furniture, indoor wood furniture, teak furniture indonesia.